A recap of the performance of Crush Crypto Core, a DAA on the ICONOMI platform, for the month of October 2018. A recap of the performance of Crush Crypto Core, a DAA on the ICONOMI platform, for the month of August 2018. A recap of the performance of Crush Crypto Core, a DAA on the ICONOMI platform, for the month of July 2018. A recap of the performance of Crush Crypto Core, a DAA on the ICONOMI platform, for the month of April 2018. A recap of the performance of Crush Crypto Core, a DAA on the ICONOMI platform, for the month of March 2018. A recap of the performance of Crush Crypto Core, a DAA on the ICONOMI platform, for the month of February 2018. 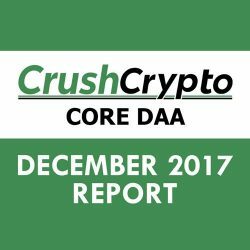 A recap of the performance of Crush Crypto Core, a DAA on the ICONOMI platform, for the month of January 2018. A recap of the performance of Crush Crypto Core, a DAA on the ICONOMI platform, for the month of November 2017. A recap of the performance of Crush Crypto Core, a DAA on the ICONOMI platform, for the month of October 2017.